The Red Violin Festival, Patron Lord Menuhin, consultant Charles Beare, has been created by its artistic director, the violinist Madeleine Mitchell as a celebration of the violin across the arts. The first festival in Cardiff in October 1997 was a huge success. The Russian State Symphony Orchestra, the BBC National Orchestra of Wales, violinists Ivry Gitlis, Julian Rachlin, Madeleine Mitchell, Maxim Fedotov, Hardanger fiddle from Norway, folk fiddle from Wales and Cape Bretton fiddle form Canada's Prince Edward Island. There was jazz violin, films, lectures including the violin in Art by George Melly, Professor R. Stowell on the Russian Virtuoso tradition, Professor Robert Pascall on Brahms and Joachim and Professor B. Richardson on violin acoustics, the world premiere of a fanfare for four fiddles by John Hardy. Exhibitions included archive photos of Hardanger, Breton, Robin Stowell, Bernard Richardson, from the Royal College of Music and by violin craftsmen including perspex violins and a weekend of Baroque violin with students led by Catherine Mackintosh. 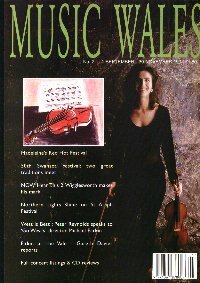 "Madeleine Mitchell has never been satisfied with being a fine violinist; she has been a tireless pioneer of new music for more than a decade. She has put together a fascinating festival which has taken its inspiration from Dufy's vibrant Le Violon Rouge paintings. Eclecticism rules... Mitchell herself will appear in the delightful Four Violins programme." "Red-hot fiddlers Festive fun.. unique celebration of the violin across a wide spectrum of music and the arts.. the very spirit of enjoyment and creativity that was part of Mitchell's vision for this lively festival. Long may it continue to be a bringer of good things." "Events to watch in October - an innovative festival celebrating the violin in all its guises across the arts. From 2-11 October, Cardiff will be resounding with sounds of the fiddle." "Unique Violin festival a resounding success"
"Madeleine's Red hot festival. The essence of The Red Violin is enjoyment, communication, creativity embracing all styles.... spearheaded by its vivacious and dynamic artistic director Madeleine Mitchell, with Lord Menuhin as patron this festival has far reaching potential." "New festival for violinists. Violinists who have previously felt left out of the close-knit communities for their string brethren can now indulge themselves at the Red Violin festival in Cardiff"
The Red Violin Festival will break new ground. "Violinist Madeleine Mitchell has broken down some musical barriers in her time... her latest scheme looks likely to give the capital a buzz... fills the large gap left by the Cardiff Festival in the Autumn season... impeccable credentials." "First British festival dedicated to the violin in all its manifestations. BBC Radio 2 went to Cardiff and joined in the fun with a programme which included a conversation between Yehudi Menuhin and the organiser of the festival the international concert soloist Madeleine Mitchell and through it came the sensuous love Lord Menuhin feels for this instrument which more than most seems like an extension of the human voice." "Red Hot As the festival season draws to a close. .the best has been saved till last." Other features: BBC Radio 2 documentary, BBC Radio 4 Woman's Hour, BBC Radio 3 In Tune, BBC Wales: TV, local radio, Taplas folk magazine, Welsh Tourist Board, Classical Music, Folk Roots Magazine.